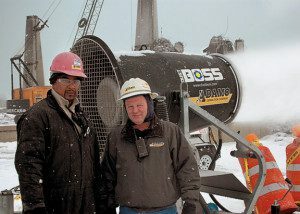 Combining power and mobility, the DustBoss® 60 (DB-60) is the industry’s most versatile dust control cannon—covering more than two American football fields in dust-trapping mist with its powerful 30,000 CFM fan. That’s why the DB-60 is the only cannon OSHA lists as an option for control of airborne silica dust. DustBoss uses atomized mist—the only dust control technology that provides both airborne and surface suppression. It creates airborne suppression by sending tiny atomized water droplets into the air to capture fugitive dust particles and take them to the ground. And it provides surface suppression when those atomized droplets impact on the surface and seal themselves there—along with the dust. This entry was posted in DB60-Suppression, silica dust control. Bookmark the permalink. Both comments and trackbacks are currently closed.